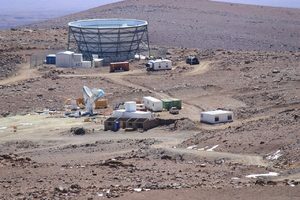 New telescopes to be built in Chile’s Atacama Desert will join the pre-existing Polarization of Background Radiation (POLARBEAR)/Simons Array experiment and the Atacama Cosmology Telescope to form the Simons Observatory. This new facility is designed to detect the extremely faint signals of cosmic inflation, a hypothesized exponential expansion of spacetime in the instants immediately following the Big Bang that produced our universe. 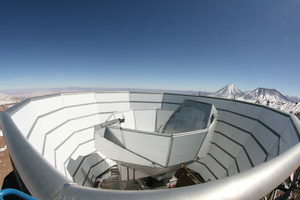 The Simons Foundation, together with the Heising-Simons Foundation, will support construction of the new telescopes and accompanying new receivers through a five-year, $40 million grant to the University of California, San Diego (UCSD) and four other research institutions: the University of Pennsylvania; the University of California, Berkeley; Princeton University and the Lawrence Berkeley National Laboratory. These institutions will also provide support to the observatory. “We’re trying to uncover what the universe looked like a trillionth of a trillionth of a trillionth of a second after the universe began,” says Brian Keating, a cosmologist at the University of California, San Diego and project director of the Simons Observatory. Achieving this goal, he says, could lead to a better understanding of the physics of the Big Bang, the nature of dark energy and dark matter, the properties of neutrinos and the formation of structure in the universe. Many teams of astronomers around the world are searching for signals of cosmic inflation. The Simons Observatory collaboration grows out of two such previously independent projects: the POLARBEAR project, led by Keating and Adrian Lee of the University of California, Berkeley, and the Atacama Cosmology Telescope project, led by cosmologist Mark Devlin of the University of Pennsylvania, and Lyman Page, David Spergel and principal investigator Suzanne Staggs of Princeton University. The Simons Observatory project combines these two efforts and adds new telescopes outfitted with new receivers and detectors, as well as new data-analysis capabilities. This effort will enable cosmologists to examine the moment when the universe began its explosive expansion, before the relic radiation of the Big Bang — the cosmic microwave background — last interacted with matter, 380,000 years after the Big Bang. “A lot was going on well before then,” says Devlin, who is project spokesperson for the Simons Observatory. According to the theory of inflation, immediately after the Big Bang, the universe was extremely hot, dense and compact. In this state, quantum fluctuations — variations and perturbations in the universe’s energy distribution — would have been imprinted into the gravitational field of the infant universe. During inflation, those quantum fluctuations would have been stretched into gravitational waves, which, in turn, would have expanded and compressed space and polarized the cosmic microwave background. That polarization would have produced specific ‘swirl’ patterns, called B-modes, in the polarization of cosmic microwave background radiation. Detecting these swirling, pinwheel-shaped patterns would be ‘smoking-gun’ evidence that inflation actually occurred, and measuring their intensity could reveal the energy scales that existed at the start of the universe. In addition, detailed measurements of the cosmic microwave background and its distortions as it interacts with structures forming in our universe will help cosmologists determine the masses of ghostly elementary particles called neutrinos, and the nature of dark matter and dark energy. “Their detection might even be the first, and only, experimental evidence for quantum gravity — a sort of holy grail for physicists,” Keating says. These scientists and others who will work at the Simons Observatory hope to set the stage for such discoveries and serve as a pathfinder, Devlin says, for a much larger effort aimed at extracting the full measure of cosmological information from B-modes. 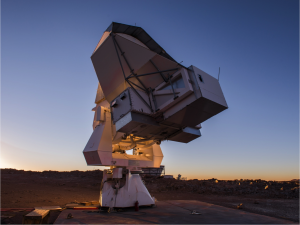 The Atacama Desert has already been identified as a potential site for such next-generation cosmology experiments, and the team hopes that the Simons Observatory collaboration will help develop the site toward that goal.